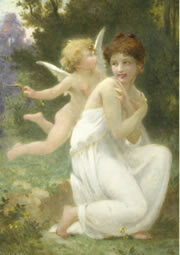 In Greek mythology, the two fish represent Aphrodite (Venus) and her son, Eros (Cupid). 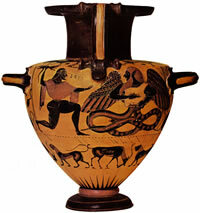 How this came to be is related to the great battle between Zeus and Typhon. Typhon was a terrible monster, created by Gaia (Mother Earth) after Zeus had defeated his father, Cronos, in a battle for control of Mount Olympus. After Zeus won that battle, he banished Cronos and the Titans, who has supported Cronos and who were the children of Gaia, to Tartarus. In revenge, Gaia created Typhos, who was said to be the most powerful and evil monster there ever was. He was covered in snakes and had wings that blocked the light of the sun. He was so big that his head touched the stars. He breathed fire like a dragon and spat rocks from his mouth. Typhos attacked Mount Olympus in an effort to restore Cronos to the throne. All of the gods and goddesses were so frightened that they fled into the woods of Egypt and disguised themselves as animals. Zeus was the only one who remained behind to do battle with and eventually conquer Typhon. One day, as Aphrodite and Eros were walking in the woods, they heard the monster crashing through the trees in their direction. Aphrodite took Eros' hand and they ran to the shore of the sea, where they turned themselves into fish and swam safely away. They tied themselves together with a cord so that they would not lose each other. After Zeus regained control of Mount Olympus, he immortalized their great escape as the constellation Pisces, which he put under the protection of Poseidon (Neptune), god of the sea. The brightest star in the constellation represents the knot, or the tie that binds. In some variations of this story, Poseidon sent two dolphins to save them and these are the two fish represented by this constellation. Typhos was eventually exiled to Sicily, where Zeus dropped the great volcano, Mount Aetna, on him. It is said that the rumblings, smoke, and eruptions of the mountain still come from this terrible monster. The energy of Pisces is soft and flowing. As the last sign the zodiac, it is associated with escaping from the confines of the mortal world and entering into the spiritual realms. It is a mutable sign, which shows its changeable nature. It is also a water sign, signifying its great depth of emotion. When planets move through Pisces, our spirits want to fly free. We feel no boundaries placed upon us. 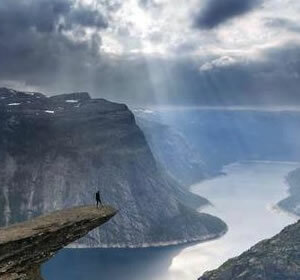 All of our longings for beauty and love come face to face with the vastness of the universe and our place within it. Our awareness of the divine can lift us completely off the ground. Ruled by Neptune, the planet of illusion and delusion, Pisces brings us extreme sensitivity to the thoughts and feelings of others...so much so, in fact, that we often mistake them for our own. Our sympathy and willingness to sacrifice is easily preyed upon by unscrupulous individuals. We can fall into the role of perpetual victim. It is easy to get caught up in the emotional pitfalls of someone else's life. And then, we go to great lengths to escape from them. Drugs and alcohol can be seductive sirens. Too much of this Pisces energy can be overwhelming to our emotional system, leading to a sense of deep despair. At these times, we need to connect with our higher power. Like the two fish of the constellation, swimming in opposite directions, we struggle with the dilemma of wanting to connect with the reality of the earthly world while also wanting nothing at all to do with it. Our task during these transits is to learn to tell the difference between illusion and reality and get our feet back on the ground. No one says it will be easy, but we CAN do this and save humanity at the same time. Just look at Mother Theresa. The constellation of Pisces is a faint constellation with several binary stars that mostly require a telescope to be discerned. According to the ancient Babylonians, Turks, Syrians, and Arabs, its stars create two fishes joined together by two strands of knotted rope. Pisces is the Latin word forFishes. 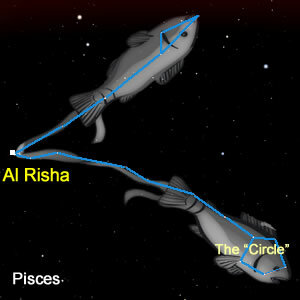 The brightest star in the constellation, AlRisha, translates from the Arabic to "the cord" and sits at the point where the cords that are connected to the two fish are joined. It is actually a pair of white stars. The second brightest star, Samaka, is Arabic for "fish" and lies along the asterism called the "Circlet", which represents the western fish. Due to the effects of precession, the Vernal Equinox has gradually shifted west into the constellation of Pisces, just below the Circlet. This is the point in time and space where the sun crosses the celestial equator each year around March 21, on its way north. This point is also known as the First Point of Aries. This constellation also contains two known meteor showers. Although rather weak and diffused, the Piscids and the less well-defined Gamma Piscids can be seen from mid-August to mid-October. 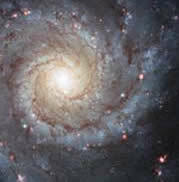 Perhaps the most important object contained within its boundaries is the beautiful spiral galaxy M74. The constellation of Pisces lies between the constellations of Aquarius and Aries, southwest of Andromeda, and directly below the Great Square of Pegasus. It can be seen rising in the evening sky during September through January.